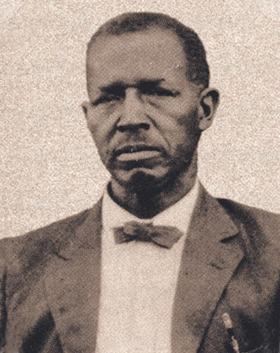 Edward Sewell Doty was a black educator who was elected principal of the “Douglas Colored High School.” After the school suffered a fire, a new brick school was given his name, Doty High School. This segregated school was closed in 1967. Edward Sewell Doty was born in Greenwood, Louisiana (between Shreveport, LA and Marshal, TX) in 1866 to former slaves Agnes and David Doty. E.S. Doty attended Prairie View State Normal College. Around 1892 he came to McKinney and became a teacher at the Frederick Douglas School with T.J. Douglas as the principal. In 1901, Douglas resigned to take a civil service railway mail clerk appointment. E.S. Doty was elected by the School Board to the position of principal which he held until his retirement in 1941. During his tenure as principal, Doty was as active in the community as he was in his school. He took part in politics as a delegate to the 1902 County Republican Convention. He was the Secretary of the St. James Christian Methodist Church which housed some of the school’s students after the original wooden school burned in 1938. In 1939, funds provided by the Works Progress Administration produced a new two-story brick building which became the E.S. Doty School. City School Supt. Jack R. Ryan hosted and open house at the new school to which “the white citizenship of McKinney” was invited. The school closed in 1967. The building is now home to the Holy Family School. At the end of Doty’s tenure the school became one the the few all-black schools in Texas to be accredited, meaning that graduates could be admitted to any black college without examination. Doty died in McKinney in 1947, several years after his retirement. He lived with his wife Amelia at 607 Railroad in McKinney.